For the 2018 re-publishing of his 1971 book Transcendental Style in Film, Paul Schrader composed to illustrate his new introduction a chart for Durational Cinema and today's Transcendental Style (see chart here). He organised his chart according to the USA-centric theatrical exhibition of films, divided by a "Tarkovsky ring" separating commercial films (inside) from art installations (outside). But too many great CCC auteurs are relegated outside, to where he calls "dead ends" of durational cinema. This makes no sense on the international arthouse market. In France, for instance, the arthouse circuit is much more accomodating than in the USA. Films like Tarr's Satantango screened in arthouses in 2 parts. Wang Bing's Tiexi Qu : West of Tracks had its world premiere at the Reflet Médicis, an arthouse in Paris, in 4 screenings, not in an art gallery. All of Tsaï, Bartas, Costa, Weerasethakul, Andersson, Alonso, Jia Zhangke, Massadian had a theatrical release, albeit confidential, yet they are all outisde the "Tarkovsky ring". 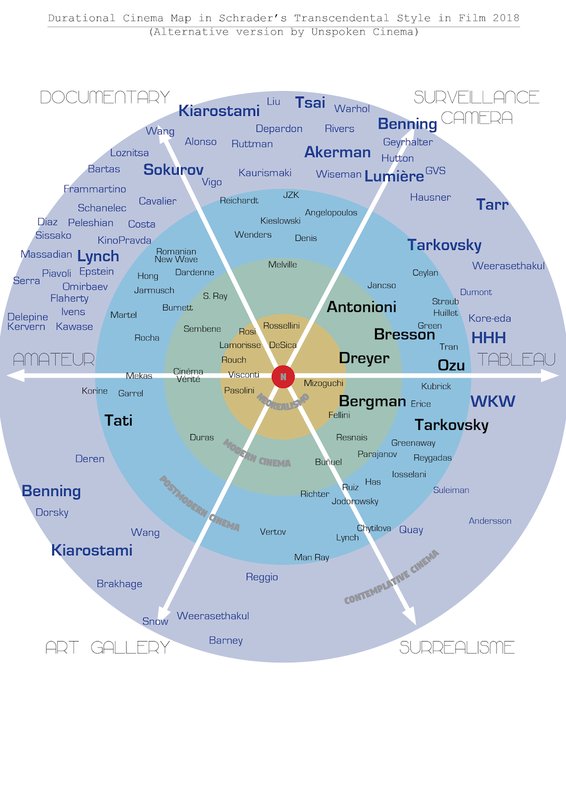 That is why I decided to omit the Tarkovsky ring on my map, and dividing it in concentric colored rings representing the phases of evolution of the narrative mode in durational cinema through the historical periods of cinema history : since the classical narration (center, red), by Neorealismo (yellow), then Modern Cinema (green), to postmodern cinema (blue), and finally the most recent iteration, Contemplative Cinema (purple). Schrader selects only 3 directions toward which durational cinema tends to escape the attraction of the nucleus of Classical Narration. I contend that the extremities of these directions are "dead ends". Like I argued in 2010, What he calls bad "Transcendental Style" is in fact a good "CCC". Meaning that what they lack in narrative drive and popular appeal, is the raison d'être of CCC and what makes this minimalist narrative mode thrive aesthetically (even if the potential commercial audience is smaller than the one of what he calls Transcendental Style today). There is cinema outside of the classical Hollywood storytelling conventions and its only viable option is not the spiritual "slow film" that Schrader favors. Not merely slower and sparse, but minimalist and contemplative. There is a contemplative audience who seeks something else unspoken, unscripted, unedited, unscored, with contemplative needs, desires and prospects. And this is a concrete theatrical market where "festival films" can tap into, at least in France, but I know afficionados of CCC are all around the world. For my map, I tried to double these endpoints and make them 6 : I kept the "Surveillance Camera" (although pejorative it is descriptive) and the "Art Gallery", but I replaced the arcane "Mandala" by "Tableau" : a tendency of auteurs to shoot composed static frames, planimetric, long takes. The 3 new directions are "Documentary" (non-fiction tendency), "Amateur" (freestyle cinematography, handheld camera, home movie feeling, diaryesque) and "Surréalisme" (oneiric, symbolist, manerism not limited to the Surrealist mouvment). I tried to place more names on the map, even though I omitted several ones proposed by Schrader that I was not familair with (Zhengfan Yang, Avishai Sivan, Brüggermann, Sara Driver, Ostrowski, Conrad, Stamper). If anybody could give me some information about these filmmakers or films, please leave a comment. The most complex was to locate auteurs in relation to one another, and to kneet the territories between one quadrant of one endpoint to the next two to its side. There is a certain continuity from Amateur to Tableau, via Documentary and Surveillance Camera. But there is more of a qualitative jump between Amateur and Art Gallery, between Tableau and Surréalisme. Art Gallery being an independent region. Astute readers will notice that some names appear twice on my map, unlike Wahrol which occupied 2 spots on Schrader's chart. To me Wahrol only represents one tendency between Surveillance Camera and Documentary. The others made films of various styles which don't fit just one tendency. I.e. Tarkovsky with Zerkalo and Solyaris toward Surréalisme on one hand, and on the other hand his other films between Tableau and Surveillance Camera. Kiarostami with his art installations toward the Art Gallery and the rest of his contemplative films close to Documentary. Same for Weerasethakul who does art installations. Benning and Wang Bing sometime do extra-long films that only show in museums. In 2012, I made up an Aesthetic Matrix trying to map out the evolution of styles in cinema history around the center of Academic narration. This "Editing Matrix" or "matrice des montages" in French, is close to what Schrader wanted to figure on his chart, with a tame academic nucleus and extreme electrons at the periphery. But this matrix was not only for Durational Cinema. I tried to base my new map on these stylistic directions. In 2007, I made a Genealogy Chart for Contemplative Cinema, delineating 7 trends in the precursors of CCC and 7 lose families of CCC today. Which would make a more accurate map of Durational Cinema if I used these endpoints instead. Feel free to criticize my choices for this alternative chart based on Schrader's, and compare it to his. I don't know how related this is, but I've noticed in Paris cinemas that contemporary arthouse figures like Ceylan, HHH, Weerasethakul, Zvyagintsev and so forth don't draw the same kind of crowd that repertory screenings of Godard, Fellini et al. tend to. If you go to see 8 1/2 or Vivre Sa Vie at some place like La Champo you'll run into plenty of 'hip' people in their twenties, even in today's world. Why doesn't this same audience go to see a new Ceylan release. Is the latter just too "bourgeois"? Or is it something else? I mention this given that you suggest the French theatrical market is more accommodating, which it is, but modern-day 'hip' audiences just don't seem interested in contemporary arthouse releases aside from maybe Haneke and Lars Von Trier. If you go to the cinema in Paris to see a Ceylan or a Zvyagintsev, the average age is 55+ and the dress code is tweed. I just don't get it. Where are all the whippersnappers if this is supposedly the 'hip new art on the block'. I dont know the composition of the arthouse crowds in Paris since I don't live there anymore. But the age average might depend on the time of the day when you go. I know here in Nîmes the audience is fairly mixed at night.